Wissel led Florida Southern to four straight trips to the NCAA Division II Tournament and three straight trips to the Division II Final Four (‘80, ‘81, and ‘82), winning the NCAA Divi­sion II National Championship in 1981. In 1972, Wissel coached Fordham into the NIT Tournament. Wissel also coached the Dominican Republic National Team in 1975. In 1972, Wissel founded Basketball World a venture that conducts basketball camps and clinics and produces and distributes books and videos. Basketball World’s highly succes­sful Shoot It Better Mini Camps are conducted worldwide for players at all levels. Basketball World is now owned and operated by Hal’s son Paul. Wissel received a bachelor’s degree in physical education from Springfield College, a master’s degree from Indiana University, and a doctorate in physical education from Springfield College. Wissel is the author of two books. Basketball: Steps to Success is a best selling basketball book with over 130,000 copies sold and has been translated into eleven languages. Becoming a Basketball Player: Individual Drills has been made into a DVD. 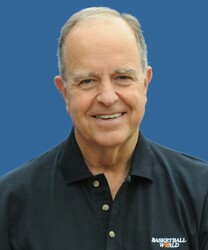 Dr. Wissel has produced five other DVDs, Basketball Shooting: Confidence, Rhythm and Mechanics; Basketball Shooting: Off the Pass, Off the Dribble and In the Post; Basketball Shooting: Make Your Shot Automatic; Basketball Shooting: Creating Your Shot Off the Dribble; and Basketball Shooting: Post Moves and Drills. Wissel’s honors include being named Coach & Athlete magazine’s Eastern Coach of the Year in 1972; Sunshine State Conference Coach of the Year (‘79, ‘80, ’81); and Division II National Coach of the Year by the National Association of Basketball Coaches in 1980. Wissel has been inducted into the New England Basketball Hall of Fame, the Florida Southern College Athletic Hall of Fame, the Sunshine State Conference Hall of Fame and was named Sunshine State Conference Silver Anniversary Coach. Hal and his wife Trudy have five grown children and one granddaughter.